I am sooooooo far from perfect. I know I lie every single day. I don’t pretend not to [Wait, on second thought, I probably do pretend to not lie.] According to a study conducted by the University of Massachusetts, 60% of adults can’t have a ten minute conversation without lying at least once. But even that number makes it sound better than it really is; those people in the study who did lie actually told an average of 3 lies during their brief chat. 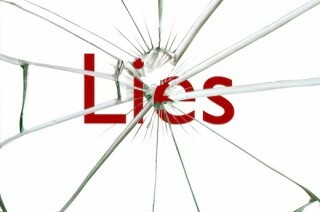 It takes two people to make a lie work: the person who tells it, and the one who believes it. I’ve heard so many lies in the last little while that I’m beginning to wonder if I’d even recognize truth if I heard it. I have to take the blame for letting lies be the norm because instead of calling someone on it, I’d pretend everything was fine. You can invent any fiction and call it a life; I’ve thought that if I did it often enough, I might start to believe it. Sometimes, when you don’t ask questions, it’s not because you are afraid that someone will lie to your face. It’s because you’re afraid they’ll tell you the truth. Lots of things in my life are a Big Fat Lie. And I feel pretty stuck in the middle of.